1 tr(dc) in last tr(dc) at end. Turn work over to wrong side. Repeat * - * till one tr(dc) remaining. * In top of next tr(dc) Start 1 tr(dc) but only until you have 2 loops on your hook left. leave these 2 loops on your hook. leave these 3 loops on your hook. Yarn over hook and pull through all 4 loops. Repeat * - * to last tr(dc) group. Repeat * - * to last tr(dc). 1 tr(dc) in last tr(dc). Lovely scarf! It's spring here, so I'll have to keep it on the back burner for a few months... it's all summer cottons here for a while :) Thanks for posting the pattern! Fantastic! The scarf looks very beautiful! Thanks for your tutorial, it's awesome! Es muy bonita la bufanda. Me encanta el color verde y la flor naranja. Oh, this is nice!! 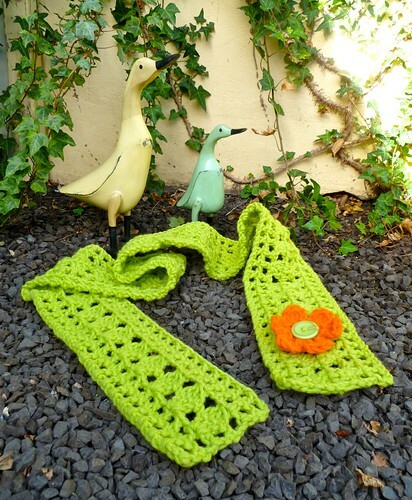 And with softer and thinner yarn this would make a good summer scarf! Fab scarf! Thanks for the tutorial...will definitely be giving that a go. Spring here, so will be making one up ready for the Autum in a few months! Beautiful scarf. I must make one. Thanks for sharing. I love your all lovely work. 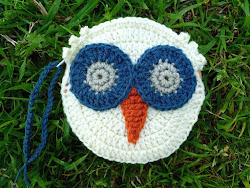 Michelle, this is so cute, thanks for posting the pattern. It looks like a quick fun scarf to make. What a lovely tutorial again. Since I'm on the opposite side of the globe from you, I might use it for a delicate summer scarf with really thin cotton.... Love it anyhow! pretty scarf! I love the colors you used! I LOVE this scarf! 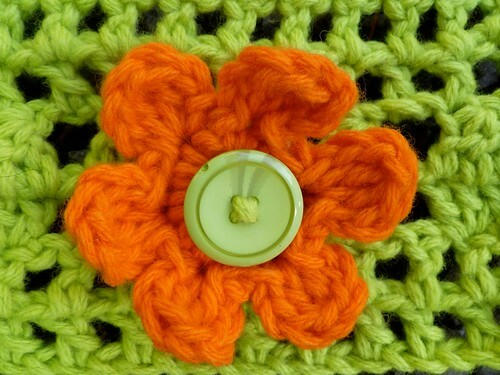 I'm also headed into summer, but with the way I crochet, I should start it now and I'll have it ready for my winter!! thank you for posting this!! This is the first scarf I've crocheted. I've made hats and purses using similar stitches so it went really fast. 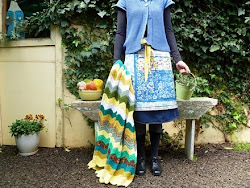 Well written pattern and photo tutorial. Thanks for sharing! Fun and fast patterns like these give me the confident to keep crocheting. I used medium weight yarn because I can't buy chunky yarn in my town. I also used an H hook. Thanks from North Carolina, USA. Here are photos of my attempt. Approximately how many yards of yarn did you use? Thanks for the project! :-) I whipped it up in no time & LOVE it! Love the scarf! I'm hooked on all types of Granny square, too! Today, in Texas, USA it will be 106 with a heat index over 108...needless to say I will not need this scarf for some time! Can't wait to make it anyway! Thanks again from Texas, USA! I really appreciate how you added U.S. terms in parentheses...thank you! Also, I love how you added photos to each step. You're a very thoughtful pattern writer. I can't wait to get started. Thanks again. hi im in So. Calif. and dont need heavy and im itchy around wool,would u say this pattern will look good in 4ply soft poly yarn? what size hook,USA size please. Love it!!! Just made this in red. Went very fast, will be making more of these. Thank you for a great pattern & directions. THANK YOU SOO MUCH FOR SHARING THIS!!!!! I'm 12 yrs old, and it is very easy and quick! Love the flower too! Thank you for all the pics too! (I like pics very easy) thank you! Your tutorials are so easy to follow! Thank you so much! 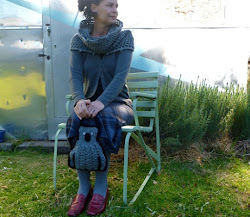 I LOVE this scarf, but I want to make it longer, in order to do so, do I need to increase by multiples of 3? Or...? Thank you! Thanks for such a beautiful pattern! It comes together so easily and looks amazing! Nice design, but I'd like to be able to print a version with just the written directions (to save paper and printing costs). Beautiful Scarf.. love it. Greaat tutorial, thanks. I had some chunky yarn given to me and I made it into the 5th row before I ran out of yarn. Your step by step instructions were great. I am a beginner and it came out just like yours. I am not sure I like the chunky yarn as the scarf seems very heavy. 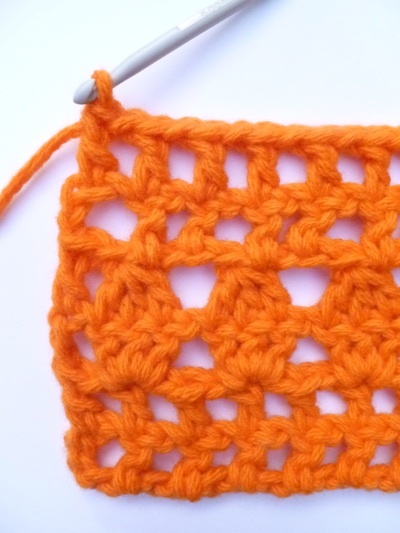 I am going to try it with some lighter yarn because I love the pattern and it works up so easy. Thank you for the time and effort it took to make this tutorial. Can't wait to try it again. I'm needing something fun to do in the hospital in a couple of weeks. Knee replacement. 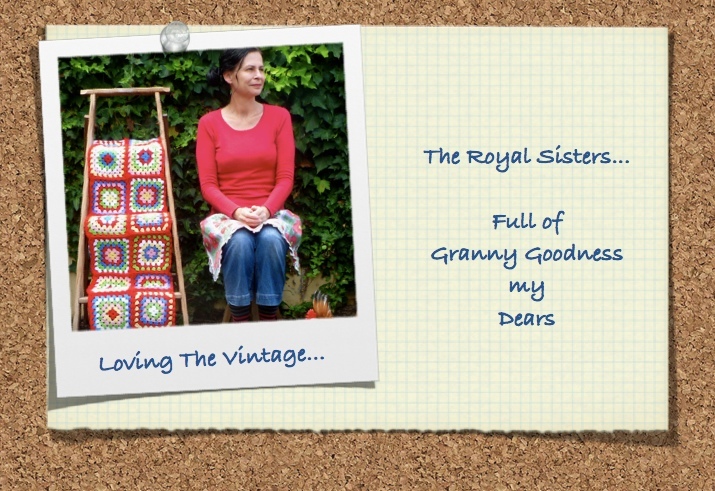 I'll make three, for my three granddaughters. 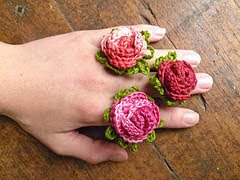 I am going to teach a beginning crochet class and I wondered if I could use your pattern to teach the class. I tried to email you, but the link to email did not work for me. I would of course give full credit to you for your pattern and direct the students to your blog. 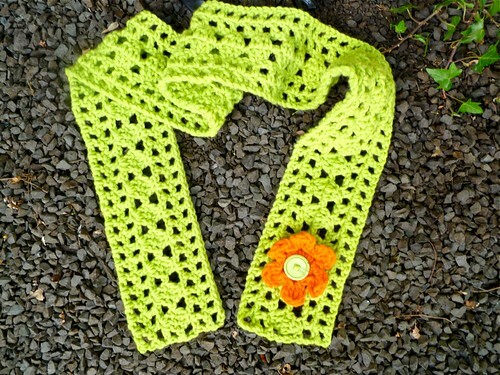 When or have you already posted the pattern for the flower on this scarf. I would love to make one. Thank you for sharing this pattern.